TL;DR: Not having the ability to market and pay salaries like Google and Facebook doesn’t mean you are relegated to second-tier talent. 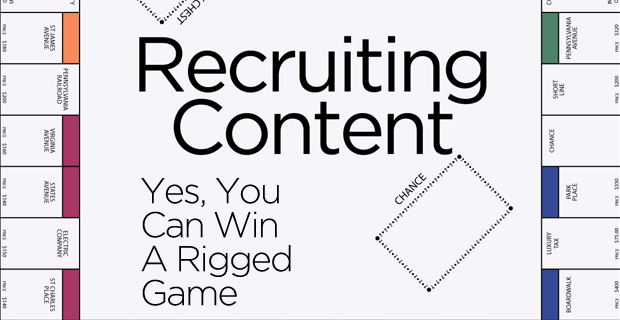 If you tell your own compelling story with recruiting content, you can build engagement and ties that money simply can’t buy. I love Michael Lewis’ Moneyball, the story about how Oakland A’s General Manager Billy Beane used different metrics to discover overlooked talent to win far more games than his budget should have allowed. I love it so much I started re-reading it (for the third time) again on the plane last night. Recruiters love to reference Moneyball, because on one hand, it is the story about how the way we measure talent has changed. Beane was drafting kids who didn’t “look the part” but were still able get on base more than average, while the rest of the scouting focused on trying to see some ethereal sense of “talent.” But because the scouting community regarded and measured talent the same, someone who fit the expectations of what a ballplayer looked like could expect their price to rise ten-fold because the demand was so high. The company with the biggest budget can buy the most ad space, promote the most jobs, stage the most events, and buy the most recruiter seats. Would you rather play this game as you or as Google? But while Moneyball is all about how we measure talent, that’s only the story on the surface. The real story of money isn’t clear until the sixth paragraph, when Lewis starts to talk about how the playing field for all teams isn’t level – that some teams have exponentially more money to recruit players than others. A team like the A’s, who had one of the lowest payrolls in the league, was almost expected to lose to a team like the Yankees, who can afford to pay almost without regard to budget. But the A’s weren’t losing. In fact, they made the playoffs again and again by offering peanuts to talent no one ever heard of. So in a game where the other players have far more resources than you, the real question the book asks is: how can a underfunded team like the A’s compete and win so well? How were they able to win a game rigged against them? The parallels to the nuts and bolts of talent acquisition are pretty clear. In a world where Google and Facebook seem to have no limits on the cost of talent acquisition, how can you possibly compete in this rigged game? Again, on the surface of it, Moneyball talks about how changing the way we measure and value talent can give someone an opportunity to hire hidden gems and build a winning team. But at a deeper level, what’s happening is that Beane realized he would always lose the game if he played it like everyone else did. He needed to find a new way to play the game. Taking a step back, the modern recruiting model is that you need to get as many people to see your job openings as possible, then have those job openings lead to an ATS. You have any number of tools to get people to those job lists: ads, job boards, search engine marketing, microsites, billboards, hiring events, college events, recruiters, etc., etc., etc. You can see that in this game, the company with the biggest budget can buy the most ad space, promote the most jobs, stage the most events, and buy the most recruiter seats. If I laid this game out in front of you, would you rather play as you or as Google? Obviously, if you want to win this game, you need to have the most resources to grab the most attention, to generate the most awareness, to drive the most traffic. The lesson in Moneyball isn’t how to change what you measure, but how to move the game to a place where you have a fighting chance – or better yet, a distinct advantage. You win a rigged game by changing the game. That’s all well and good, but how can you change a game we’re all already playing? Who will let you change the rules halfway through? Back in the book, the big change was the use of data to help evaluate prospects, to find candidates who didn’t pass the muster of the recruits. They figured out what skills and metrics lead to wins, not just what common wisdom suggested a ballplayer should look like. In the same way, go back and look at what you are trying to achieve. You actually don’t want more ads and more traffic and more applications. You want one amazing candidate for every job opening you, not dozens or hundreds of prospects. That changes the game immensely, doesn’t it? Instead of fighting an ever-escalating arms race of who can put the most ads in the field, who can cast the widest net, and who can get the most applications, you need to think very differently about drawing that one perfect candidate in. First, get specific. If you don’t want a thousand resumes but just want one good candidate, don’t write the broadest possible job description and ad. Picture the right person who would rock that job and try to think of all the traits they possess. Then think about what they do now, what they like to do, how they spend their free time, etc. It’s not that they can do Excel, or that they know how to build formulas, but that they love building dashboards. It’s not that they have pets, or have dogs, but that they have a shiba inu, or rescue pugs and bulldogs. When you get specific about what you’re really looking for, it allows you to rewrite the information around the job description to appeal to exactly that person instead of a vague idea of what all people are. You can’t please everyone, so stop trying. Just focus on that one strange mix of skills and attitudes that will rock the job. Recruiters might call them purple squirrels, but I’ll quibble with that label. A purple squirrel is a set of needs that are nearly impossible to find. I’m talking about getting specific with who you want to attract. The second way you can change the game is to excel at something most other companies can’t – something that compels more applications from more selective applicants. You could invest in content. Most companies ignore recruiting content, or assume that their brand or their marketing team are doing enough to drive and compel applications. To which I say, if that’s true, why are they also spending so much on ads? Content isn’t magic, but companies treat it like it requires a blue-ribbon committee to even admit that you have a benefits package. None of these pages or articles or essays will be mind-blowing. In fact, some of them won’t be all that well written. But by publishing these five things publicly and connecting them to every job, you are now in the top ten percent of all hiring companies in terms of telling a story people would want to know. You’ll convert prospects at a higher rate and attract a larger pool of potential applicants just by starting there. If you show that you are willing to talk about yourself without sounding like a team of lawyers is coaching you, you’ll be light years ahead of the competition. Finally, the willingness to say and publish content is good, but saying something unique and interesting and authentic is how you really change the game. Think of a big company, having to appeal to millions of customers, hundreds of thousands of applicants and tens of thousands of employees. With so many different audiences, there’s no way to appease and energize all of them with a single message. And yet, that seems to be what so many big companies want to do. On the face of it, it must appear cost-effective, but when you get into it, it’s the millions of potential customers who will be served by broad, sweeping messaging. You need to pull your message away from the marketing team to make sure your audiences are properly served. Otherwise, anything you say will have to be watered down to avoid offending those potential customers. Then, you need to narrow your focus, not just to all potential prospects, but to likely prospects and even likely fits. If your company is focused on changing the world, your message has to appeal to people who also want to change the world. Just because there are talented people out there who could work for you but aren’t as invested in changing the world, don’t try to fit them into your message. They won’t fit in your culture long term, so stop trying to attract them. Build your message and content around the people who you really want to see in your interviews. Being specific in your message means you can be real. It means you can tell stories about who you really are without turning them into meaningless “marketing speak” or vague niceties. Content is often a place where smaller companies, ones who have miniscule budgets, are making their stand. It’s not that they chose content, but much like the A’s, their budgets didn’t give them much choice. They know their company backwards and forwards, and know how to tell their story in many different ways. They even let their staff tell the story for them. If you’ve ever seen a job description that was interesting, well-crafted and communicated the emotional heart of the brand, chances are it came from a small company, because they can afford to (and in fact must) be laser-focused on who they want to have work for them. I’ve seen funny job descriptions that were effective because they reflected the humor of the people who worked there – people who took their work seriously, but themselves less so. That’s the sort of leap that you need to think about taking. If you started a game of Monopoly with a smaller stack of cash than your opponents, you can’t count on buying up properties with the same speed as they will. Your circumstances dictate a very different strategy. The trick is to admit you can’t play the game the same way they can. When you look at the stack of marketing cash in front of you and compare it to that of your rivals, don’t be dismayed to find you are not the fattest cat at the game. The game, no matter how well rigged, can be won. You just need to find a better way to play the game. Monopoly board images were created without permission, but we thank Elizabeth Magie, Charles Darrow and the Parker Brothers for creating such a great game.